Free Wi-Fi and seasonal outdoor pool are featured at this hotel. The town centre of Pharr is 3 miles from the hotel and off Interstate 281. 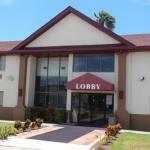 Cable TV and coffee making facilities are standard in rooms at the Red Roof Inn Pharr - McAllen. Rooms have large windows and red floral bedding. Guests can work in the business centre or use the laundry facilities. The hotel serves a daily breakfast, with hot waffles and coffee. Red Roof Inn Pharr - McAllen is 15 minutes’ drive of the McAllen Medical Centre. The hotel is 7 miles from the McAllen Airport..